Choosing the ideal arrow is a common problem for any archer. The length of the arrow depends on your physical size, your flexibility, and your technique. The correct arrow spine can depend on the draw weight of the bow (at full draw), and also the bow type. An arrow with the correct spine rating and length will recover perfectly from the archer’s paradox and give you a good arrow flight. An incorrectly spined arrow doesn’t recover from the paradox as quickly and is much more likely to show up inconsistencies in an archers form. Recurve bows and longbows behave similarly during release. The power is greatest at full draw, and the acceleration of the string diminishes as it moves closer to the bow. For compound bows, this is different. The cams allow for a low weight at full draw, and this corresponds to a small acceleration immediately after the release. Then the closer the bowstring comes to the bow, the faster it moves and the greater the resulting arrow speed. These differences in the application of force to the arrow also have an impact on the correct spine choice. Arrow spine refers to the stiffness of an arrow. You’ll often find arrow spine measurements printed on the side of arrows by manufacturers. They will also usually be specified when purchasing arrows. But what do these numbers for ATA and ASTM spine actually mean? Without knowledge of how arrow spine is measured, it’s just a number and not a very useful one at that. The reason for this is that different standards measure the arrow spine in a different manner. Therefore, the following article provides a short overview of these measuring methods. Note: Arrow spine tables are only a recommendation and sometimes the number provided by the manufacturer does not really correspond to the measured values. There are several mobile apps which provide precise information about different arrow types, including diameter, weight, and spine. Two examples for free apps are “B4 Shaft Selector” and “Arrows”. Wooden arrows are usually not marked with a spine measurement. Rather, they carry the corresponding draw weight, with which they should be shot. The draw weight for an arrow with a certain deflection is calculated by dividing the ATA test distance (26 inches) with the measured deflection. If a shaft deflects at 0.900 inches, the corresponding draw weight is 26/0.900 = 29 pounds, for a 26-inch long arrow. If the archer is looking for matching arrows for a certain draw weight, 26 is divided by the draw weight at full draw in order to calculate the desired deflection. 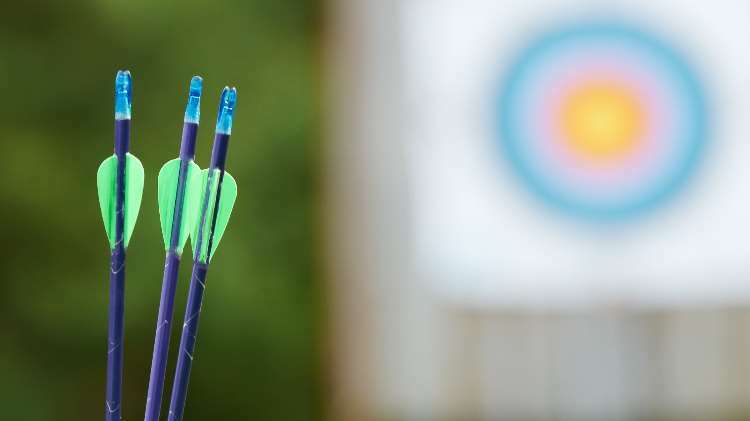 An archer with 30 pounds at full draw requires arrows which deflect at 26/30 = 0.867 inches. However, experienced wooden arrow archers are recommend to use arrows which are 5-10 pounds “stiffer” (26/35 = 0.743 or 26/40 = 0.650 inches). Additionally, it is recommended to add or subtract 3-5 pounds for every inch over or below 26, respectively. The ATA/AMO table below lists deflections in inches and their corresponding spines. The matching arrow spines of carbon fiber shafts according to ASTM are also provided. Example: An archer has a 35 pound draw weight at full draw and is shooting 32 inch arrows. Matching wooden arrows for that archer would have a spine of 35+10+6*5 = 75 pounds. This corresponds to a deflection of 0.341 inches. Matching carbon fibre arrows would have an ASTM spine of 421, rounded down to 400. Created in collaboration with Konstantin Tomanov from ARCO Vienna. 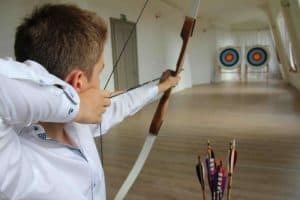 One of the best places for archery, in a penthouse, right in the centre of Vienna. Is not feasible if you disagree. Can direct weigh kids arrows to 18 inches allthe way to 34 inches which is the longest I have encountered.